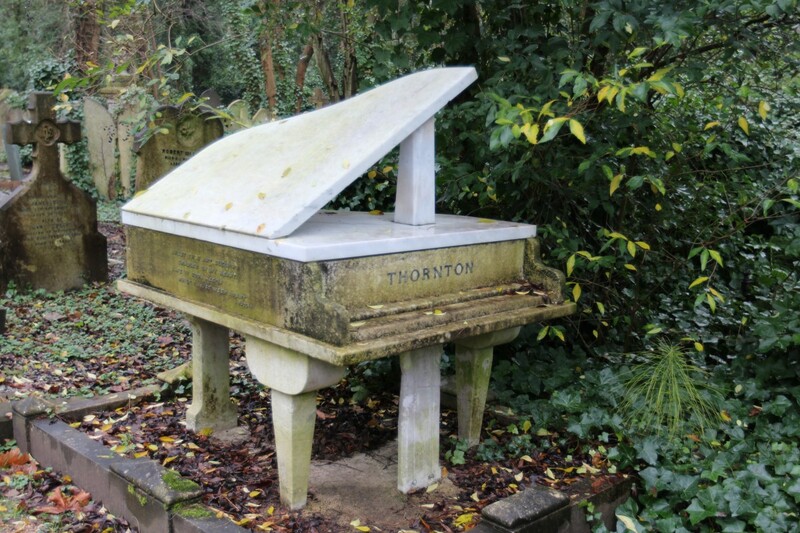 As part of our New Year’s resolution to explore more of our own country, we decided to visit Highgate Cemetery, in North London. Now, a cemetery may not be first on your Travel Bucket list, let alone on a cold, foggy Sunday morning. Even with a lot of layers on, we were still ice-cold and a damp mist covered the entire graveyard. It was all a little, well, creepy. 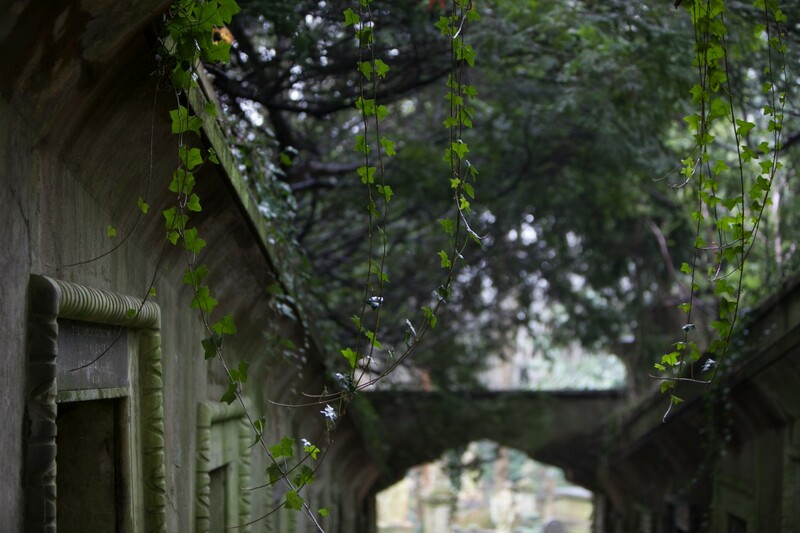 Overlooking London, high up on the hill of Highgate Village, rising to 375 metres above sea level, Highgate Cemetery is home to some 170,000 (deceased) individuals and 53,000 graves. The Cemetery was opened in 1839 as part of the ‘Magnificent Seven’ new cemeteries that were to be built around London. 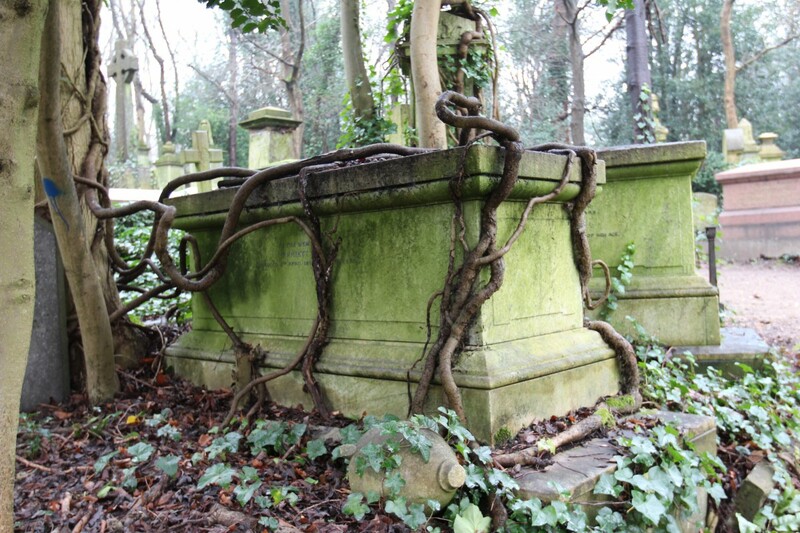 Other graveyards in London were not pretty places. They were crammed between shops, houses and taverns. Body snatchers regularly raided the graves and with illnesses like the Black Death sweeping through London, graves were shallow. This meant that within a few years, bodies were soon reappearing and bringing with them a disgusting smell. Lovely! 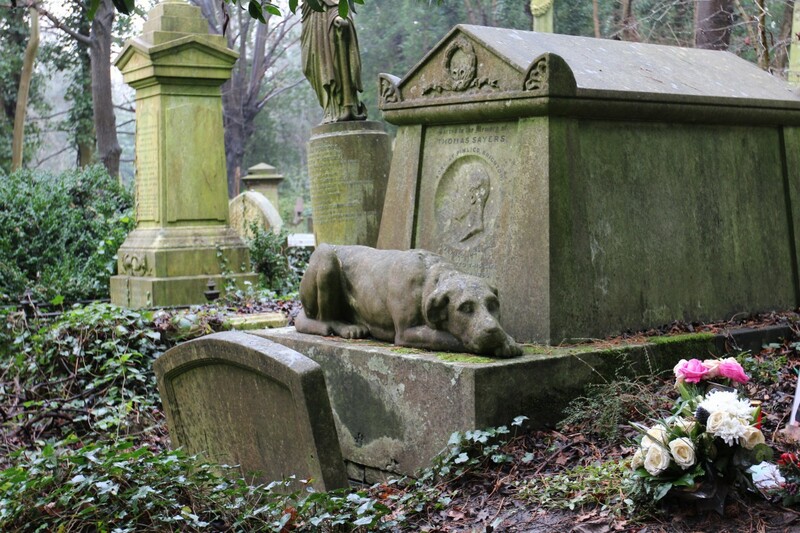 To combat this, Highgate Cemetery was built with the purpose of being a ‘respectful’ cemetery, largely for London’s elite. With the Victorian’s fascination with death, the Cemetery proved hugely popular and anyone, who was anyone, wanted to be seen here (when the time came). All this is obvious when entering both the West and East parts of the cemetery. It is gothic, Victorian, ornate, towering and magnificent. Look around and you’ll be met by the faces of angels; lions; goddesses and the odd guard dog. Huge vaults and catacombs dominate parts of the cemetery and crooked, twisted trees roots wrap themselves around the graves. People paid an enormous price to be buried here and burials became a fashionable place to be seen. One bare-knuckled prize-fighter, Tom Sayers, had over ten-thousand mourners at his own burial and his dog, Lion, led the procession as chief mourner! Lion’s sculpture still guards his grave today. Perhaps two of the most impressive parts of the cemetery are Egyptian Avenue and the Circle of Lebanon. The Egyptian Avenue is decorated, unsurprisingly, with Egyptian pillars, archways and previously, mosaic tiles. As you pass through the small passage, you can see the doors to each tomb, complete with small holes in to let the ‘gasses out’. Yuck. The Circle of Lebanon is similarly impressive and at its centre is an enormous, old, tree which stands over each of the catacombs. On a foggy, misty day, it definitely had a creepy feel to it! It took us around two hours to walk around the sprawling acres of this cemetery. 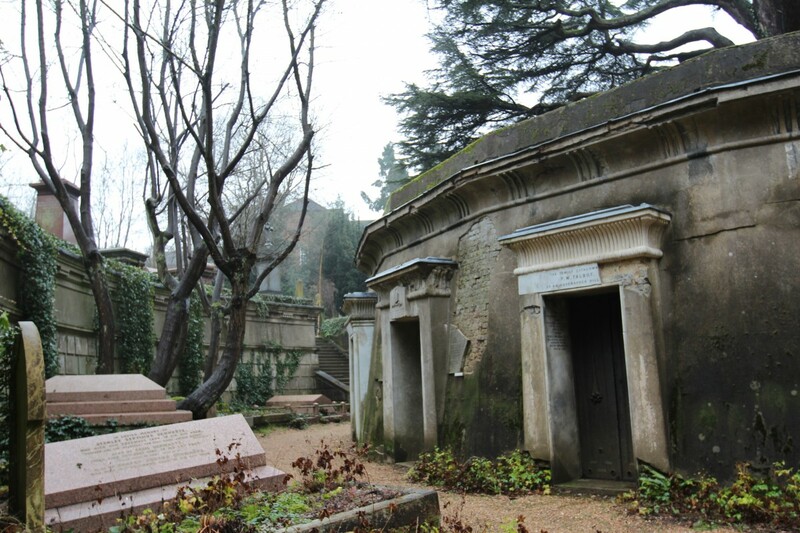 We would definitely recommend taking the tour (the only way to see the West cemetery), which provides you with all the history of the place and points out interesting graves. Notable graves include that of Karl Marx, the owner of ‘Wombell’s Travelling Menagerie’, George Wombell. "Amsterdam: the perfect city break"
Wow, I can’t believe you guys have been here! I always tell my friends to visit the cemetery when they ask for my advice on what to do in London – needless to say it gets a mixed response! Audrey Niffenegger’s ‘Her Fearful Symmetry’ book is set here – she prepared for it by working as a tour guide at Highgate, so must know the place pretty well! It’s an amazing read, I can really recommend it. May I use one of these photos for the featured image in a blog post I am doing in the resurrection of the dead?